It has been said that we Irish are prisoners of our history, an expression usually employed to explain those acts of barbarism performed in the name of distorted nationalism on one side or perverse loyalism on the other. In fact, it goes much deeper than that. We are children of an ancient culture. There are well-preserved Irish archaeological sites which date back more than 6000 years. Ornate jewellery and weaponry from the Iron Age tell of a civilisation which pre-dates the Christian era. When St Patrick challenged the pagan tribes of the fifth century, he was dealing with a disparate grouping who had a common language, a common code of law (the Brehon law) and who referred to themselves as 'men of Ireland'. When the Dark Ages descended on Europe, the lamp of learning was kept alive in Irish monasteries. This is the heritage which today's Irish claim. It has more importance than the bloody and mostly futile attempts at self determination which followed the Viking and Norman and finally the English occupations. We are prisoners of our history, but that history goes back much farther than 1916 or the Great Famine or the Battle of the Boyne. Many people today insist on seeing in the Irish, traits which owe more to wishful fancy than to mundane fact. They like to paint us as quaint, amusing, perhaps more than a little irrational; harmless enough characteristics. And can you blame us if we play to the gallery? After all, they paid their money to kiss the Blarney Stone and to buy the shillelaghs and to savour the cream-topped pint that has made a feature of its unattractiveness. There will be parades in cities all over the world this week to honour the Welsh-born missionary who brought Christianity to Ireland more than 1500 years ago. That these parades are allowed, with their attendant disruption of commerce and trade, is a tribute to subtle Irish colonialism. It is a colonialism not characterised by greed or rapine, armies or plunder, but by good humour, good company and what the Irish called, long before the word achieved a sinister meaning, good craic. It is a colonialism found in the imagery of a Heaney poem, celebrated in the dancing feet of a Riverdance troupe, voiced in the soft dialogue of a Friel play, personified in the charm and erudition of the two women most recently chosen by the people as First Citizen. Would that all colonialism was as benign. 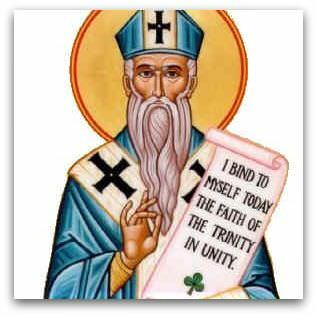 St Patrick holds the Irish in a powerful emotional thrall. As schoolchildren we were told that he refused to come down from a bleak mountain in County Mayo which still bears his name, until the Almighty promised him that the Irish would always be faithful to his message. Never mind the theology in that. Take a moment to admire the propaganda, providing justification for Ireland's adherence to Rome through centuries of persecution while warning the modern generation of a sacred trust. It is a matter of regret that this trust is no longer taken seriously. Events in recent years have shown churchmen to be as susceptible to human failings as the rest of us, with preaching too often contradicted by example. So the churchmen ceded the field to the money men, and the growl of the Celtic tiger replaced the peal of the angelus bell as a symbol of modern Ireland. It was a bad bargain. In the past six months, with banks kept afloat by the public purse, only fortuitous membership of the euro zone keeps Ireland from joining the same club as Iceland. Even still, it is a close call whether Ireland Inc. will survive. And the events of last week have shown how tenuous a hold peace has in some parts of the island. The saintly ghosts of the heroic past — Tone, Pearse, Collins — have been called upon to bless murder, to sanctify words that justify acts without sense or meaning. That Tone was a Presbyterian, that Pearse surrendered to prevent further civilian death, that Collins preached compromise — these have no relevance where only bitterness exists. Those of us who live overseas may cease to be Irish in the strict geographical or political sense, but it is much more difficult to slough off our cultural Irishness. Many of us answered the appeal of a coiffed former prime minister so that when we now cross international borders, our passports identify us as Australian. But we carry in our head another book which no amount of absence can overwrite. You won't find me wearing a green tie or, heaven help me, drinking green beer this week. But I know that I only have to open my mouth to murder that Saxon 'th' and I am clearly identified as Irish. The sole Papist Stewart Downunder gives us a good history of Ireland and the Irish who had to rely on Protestants & Agnostics to write the Constitution for the Republic of Ireland. Frank, you have written a remarkable essay on a history that unites all of us with an Irish name and heritage.The Nuns of my youth ensured that I had a firm grounding in the legends and myths of Ireland. Having visited the Emerald Isle, I too felt the keen pangs of departure that no doubt my rebel ancestors felt as they were transported to exile in Sydney Towne. Hello! I'm curious to know when this painting of Saint Patrick was made and who the artist is?